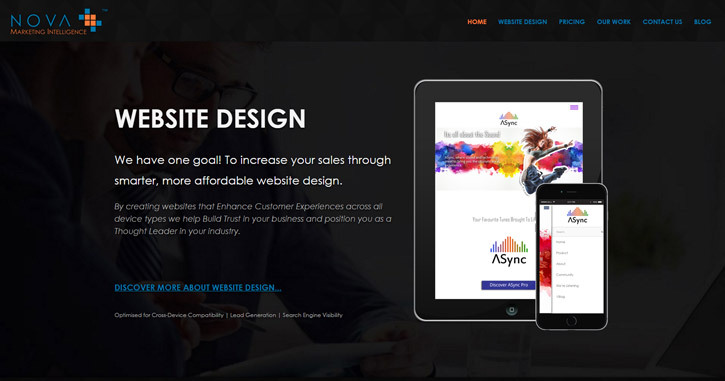 Dark themed website design has many benefits. These include creating a sense of depth, elegance as well as power. However, dark themed website design also has to be carefully planned and required specific design knowledge to implement effectively and maintain usability. 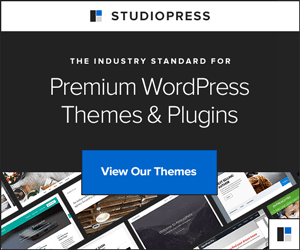 Dark themed website design has many benefits. These include creating a sense of depth, elegance as well as power. However, dark themed website design also has to be carefully planned and required specific design knowledge to implement effectively and maintain usability. 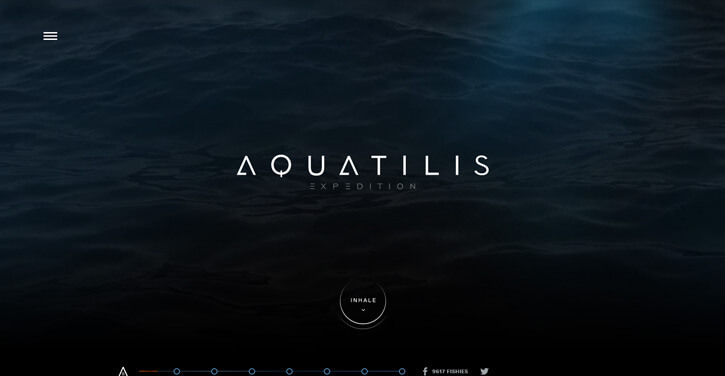 A beautiful dark themed website design, Aquatilis Expedition has to be one of our favourites. Also featuring some fancy parallax effects and stunning imagery, this site is well worth exploring for both interest in design as well as its subject matter. Dark themed website design seems a natural fit for a jewellery website. Private jeweller Gregory Jezarian’s work is elegantly highlighted using dark coloured images and design elements. 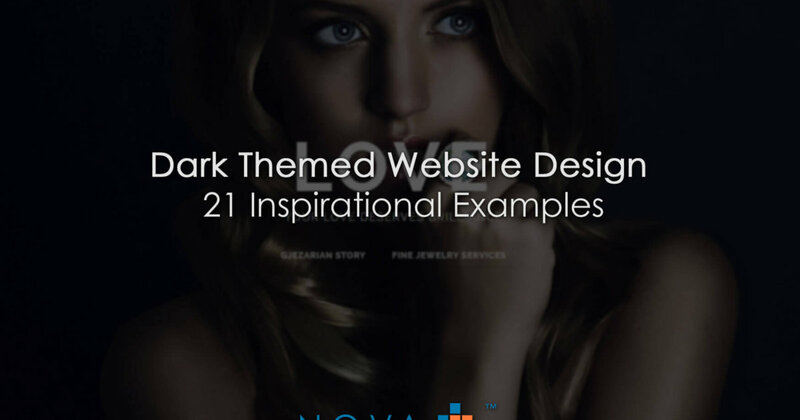 If you are looking for an elegant design or have your own jewellery business and need a little inspiration before embarking on a new site design, then do take a look at this site. 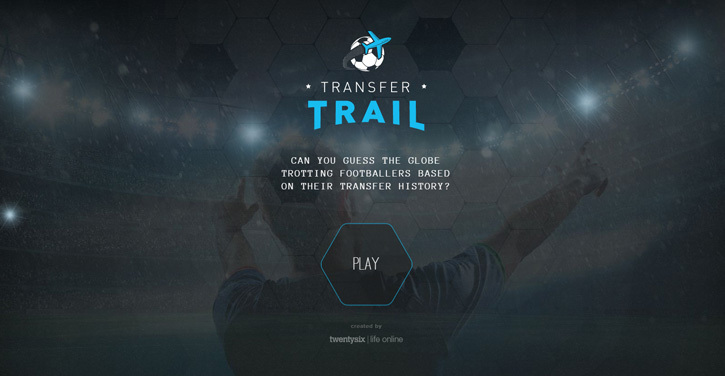 If you are a football fanatic and looking to test your knowledge, then this dark coloured interactive gaming website is worth a look. The dark combination image works perfectly to focus your attention on the website’s introduction and ‘play’ button. 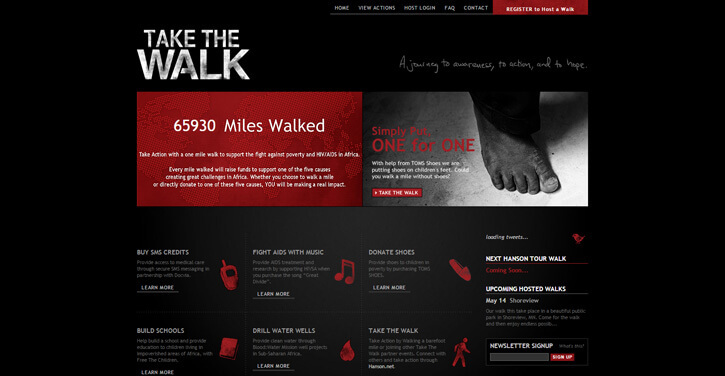 Take the Walk is all about doing something for a good cause. The website’s red colouring combines really well with the dark themed website design to create impact and draw your eyes to all the most important page elements. 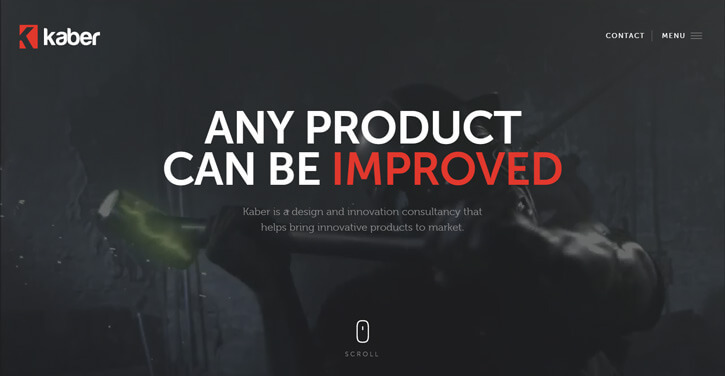 Take a look at this site for more than web design inspiration. Another one of our favourite dark web designs. The contrast between the dark colours and the blue and grey squares makes navigating this site from its home page a breeze. 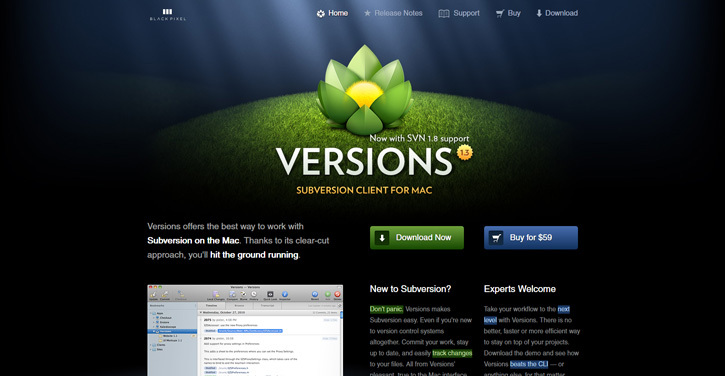 We like the limited colour scheme, which is always a good idea for dark websites. We also like the way the blue blocks have been used to direct you to the main pages on the site. 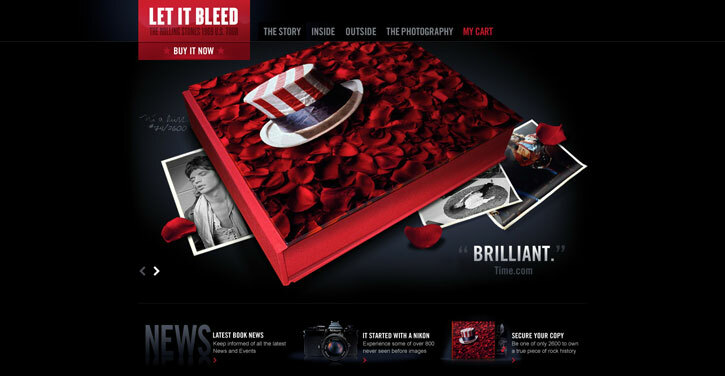 The Don Q dark coloured website design is another example of elegant presentation. 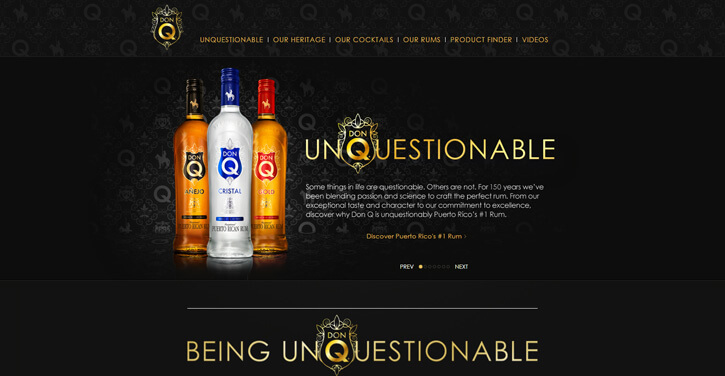 The depth and contrast of this website conjure up images of classy cocktail lounges, no doubt with a glass of Don Q rum in your hand. 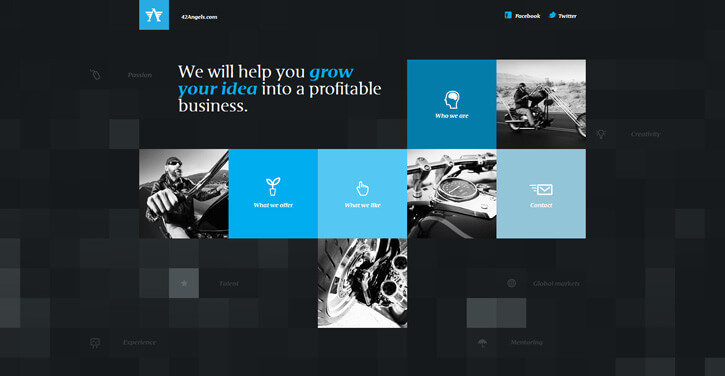 Another beautiful example of a full-screen image combined with a dark overall web design. In many ways, website design is like architecture and the combination of the two on this site creates a wonderful symbiosis. 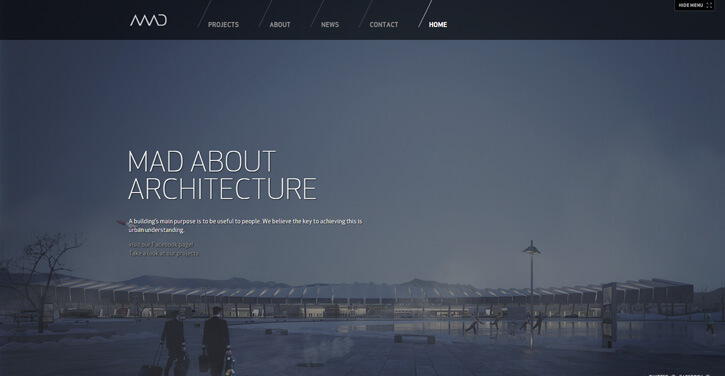 If you love architecture or design of any sort, then be sure to check out this site. Another architecture/interior design site making use of effective dark themed website design. Clever use of imagery and text make for an interesting website. The subdued background perfectly draws your attention to the site’s images, navigation and text elements. 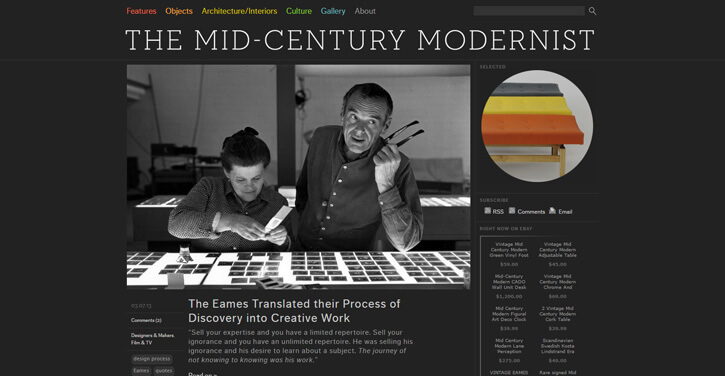 Not only does the Lars Luan website make use of dark website design, but it is also monochrome. That is until you hover your mouse over the image and then their colour bursts to life. An excellent example of monochrome design and simple user interactions. ‘Any Product Can Be Improved’. This great statement just ‘pops’ out at you through the use of dark web design. Additionally, this site features some really nice content grouping design and video backgrounds. 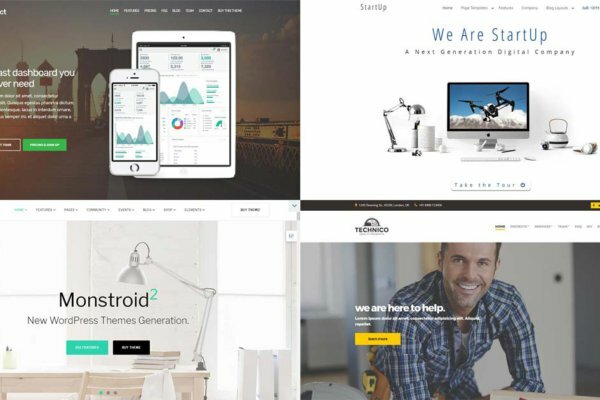 Any Website Design Can Be Improved. 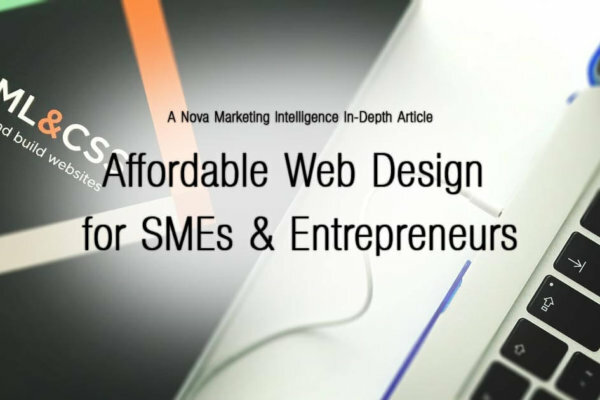 Whether dark web design is what is needed for your site, well that remains to be seen. 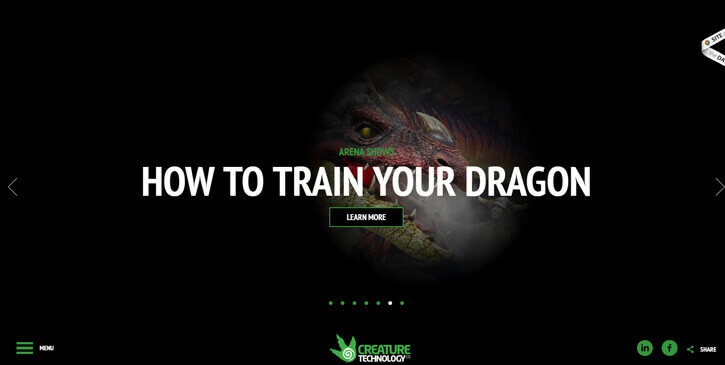 Dragons, Dinosaurs, King Kong, dark website design seems to fit so well with creatures and monsters. Not only this but the clever torch-like effect when viewing the home page images adds a great sense of mystery and expectation to this website. 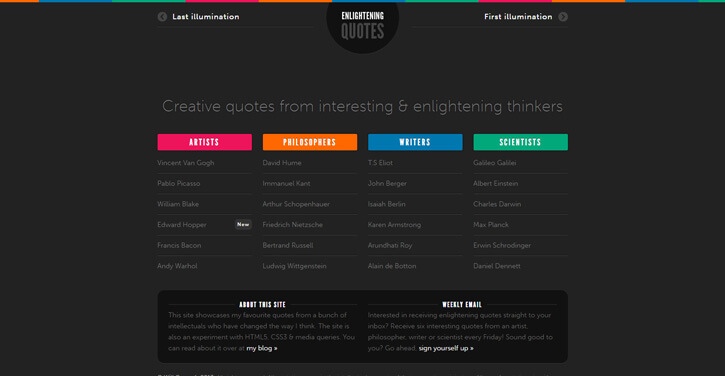 If creatures are your thing and clever use of dark colours and lighting effects then take a look at this site. Another example of eye-catching contrast created by blending dark web design with limited colours. Not only will designers love this site but so too will fans of the Rolling Stones. 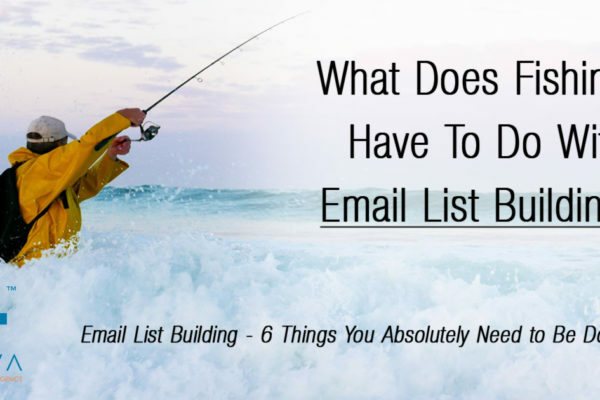 Be sure to take a look at this site for inspiration and interest. 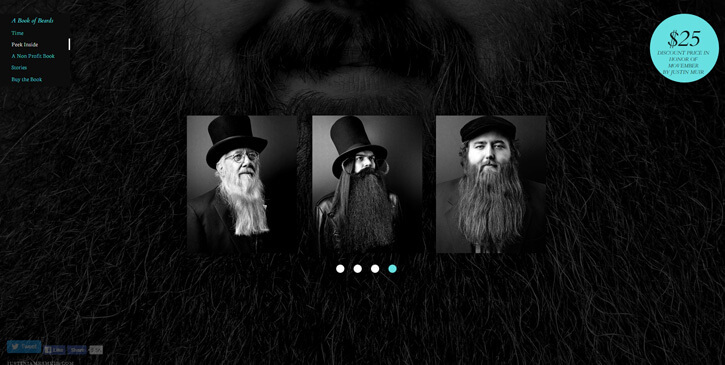 A simple site about a book about beards. PS: All proceeds from the sale of this book go to a good cause, so if you love beards or just want to help out, go take a look. Who doesn’t love a good quote? 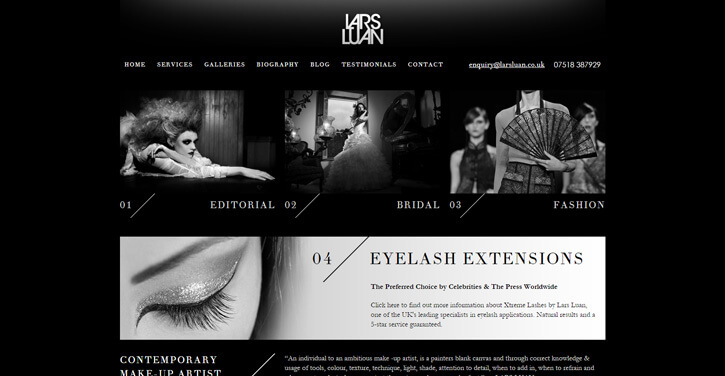 And who doesn’t love them presented so elegantly in the dark coloured web design. Simple, clear design and clever use of colour make this site an excellent example of usability and dark design. Black Pixel have made excellent use of dark design for their Versions App. 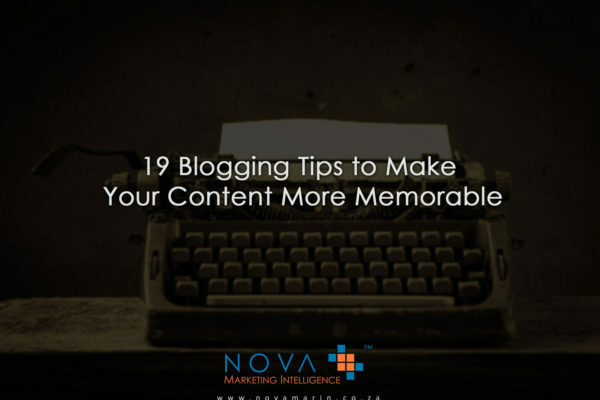 Beautiful contrast and image lighting create focus and highlight important page elements. This dark themed design focuses your attention perfectly on this robot vacuum cleaner. 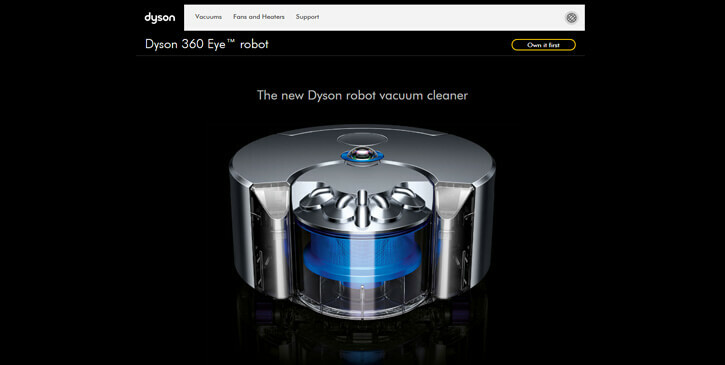 I must admit I have never seen a vacuum cleaner quite like this. Now, where can I get one of these? 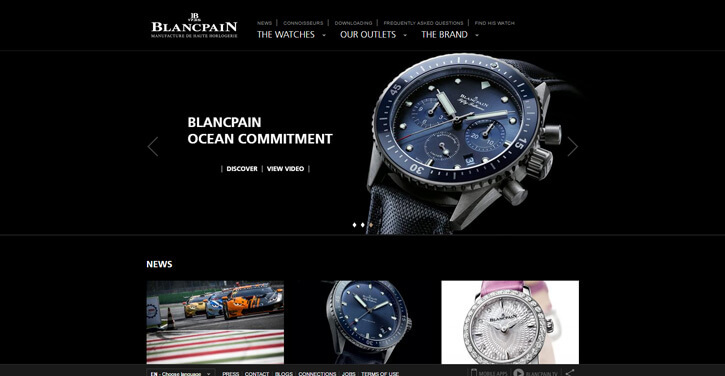 As with jewellery, dark website design just seems to make sense with watches. Particularly these elegant looking watches from Blancpain. 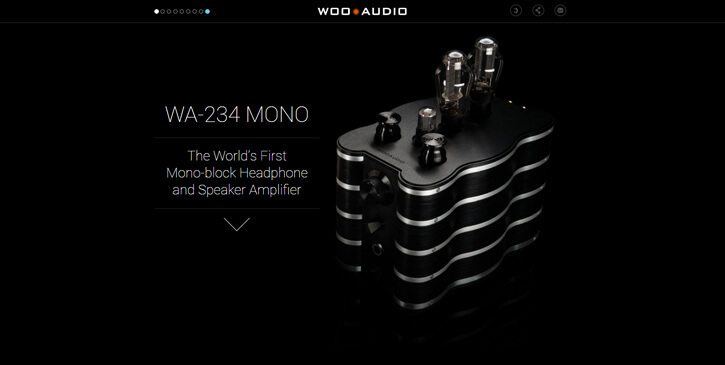 A well crafted dark website for a stunning piece of audio equipment. Your eye is immediately drawn to the exquisite lines of this amplifier. 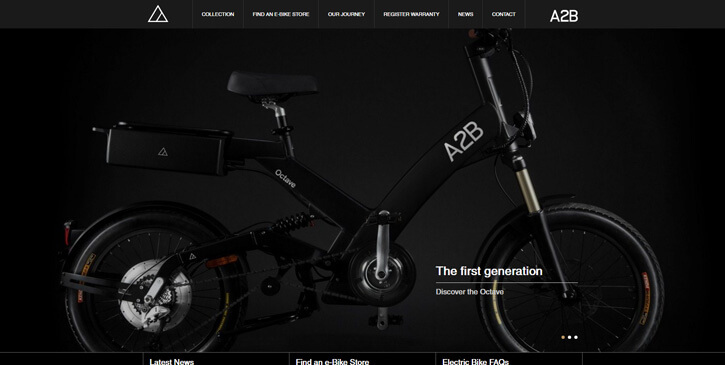 Despite the bike in the above image being dark itself, the website’s design works really well. The various highlights across the bikes surface contrast really nicely with the dark background. A great example of subdued colours in a web design. 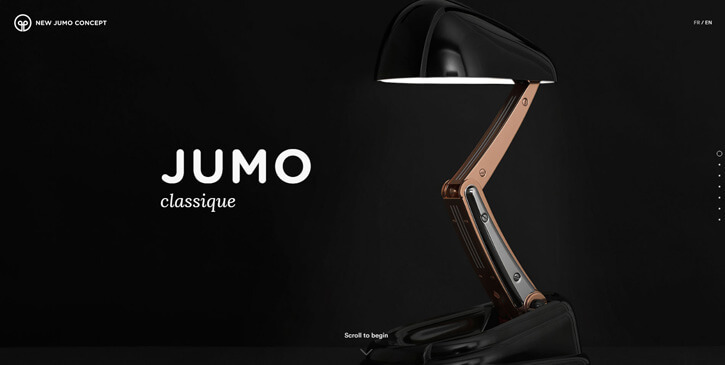 Similar to A2B, New Jumo Concept makes use of a dark image on a dark background. Yet the highlights from the lamps surface stand out really nicely and give the product an elegant look as well as the feel one might expect at one’s desk. Last but not least, is our own recently upgraded dark themed website design. As much as we loved our old light, clean, minimalist look, we’ve always loved contrasty dark designs and textures. Dark web design is not an easy type of design to pull off, especially where text legibility is concerned. However, we think we’ve done a pretty good job. If you think so too feel free to let us know. Also, be sure to tell us about any great dark designs you think we should add to this list. Disclosure: Some of the links on our website are Affiliate Links. Should you make a purchase after clicking an affiliate banner or link, we may earn a small commission.